Your child is about to go through some big changes in their life, moving from primary school up to secondary school. Young people are in a higher risk group as road users during the early years of secondary school. This may be the first time your child is travelling to school without you. Help prepare them for their new school journey and make sure they have the skills needed to judge traffic and make safer decisions. 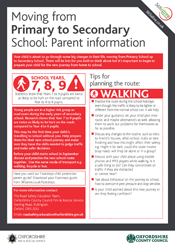 Before your child starts school in September discuss and practise the new school route together. Use the same mode of transport e.g. walking, bicycle or bus. Will your child be travelling by bus? If the new route to school involves a bus journey, consider where the bus might stop at the school. Will a road need to be crossed and if so where is the best place to do this? Talk about timings morning and afternoon. How they can ensure they always have it on them? If they miss the bus what is their plan of action? Talk about after-school clubs or any changes to the routine and how this might affect the journey. Behaviour on the bus - Ask your child what sort of bad behaviour might make it difficult for the driver to concentrate. Could silly/dangerous behaviour by one person put everyone at risk? If they see bad behaviour on the bus, make sure they tell you so you can report this to school. Ask your child do they understand the importance of wearing their seatbelt, even if there are other students who aren’t? Ask your child why is important to wait until the bus has moved off before crossing the road, if this is necessary. Once the clocks change it could be dark in morning or after school. Is your child likely to be alone at the bus stop? Is your child worried about this new journey or are they feeling confident?